When a HTTP request has been received by a server, typically a response is sent back to the client. In the case of web resources, the response will usually consist of two parts, the Response Header and the Response Body. The header part of the response contains all the response headers, including cookies (if any) and information about the mime type of the content. The response body contains the content, which should match the mine-type in the headers. For example, common mime-types might be text/html for HTML pages, and text/css for external StyleSheets. To show the response headers to a given request, we can simply cut out the headers using a combination of the options and functions. A more detailed explanation of this is available in the next section of the article, for those interested. 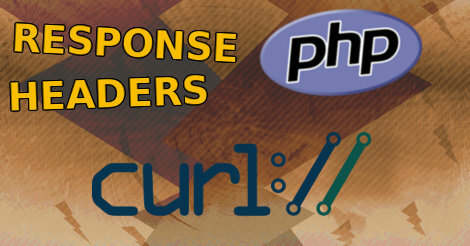 There is no build-in way to only return the response headers using cURL in PHP. However, we can still "cut" them from the full response. To do this, we first determine the size of the response header, and then simply cut it from the response using the substr() function. First, we set the CURLOPT_HEADER option true. Doing this will include the headers in the response downloaded by cURL. Next, we will need to cut out the headers. Finally, we may use the value returned by curl_getinfo() with substr() to seperate the headers from the response message. In order to better work with the individual headers, we should place them in an array. HTTP Headers are separated by a Carriage Return and a Line Feed, also known as CRLF (Sometimes also represented as: [CR][LF]). Knowing this, we can create an array from the raw headers using the PHP explode() function. Finally, we can easily work on the array in a loop.